Prof Balunywa and Barya at a previous function. Net photo. Former presidential aspirant Venansius Baryamureeba has joined the race to replace Prof Ddumba Ssentamu as Makerere University vice-chancellor. Prof Barya who was at the helm of the Ivory Tower between 2009 and 2012 when he was forced out by MUK’s endless woes is joined in the race by Makerere University Business School (MUBS) long-serving principal, Prof Wasswa Balunywa. Although the select committee announced that four professors were vying for the VC job without revealing their identities, PML Daily understands that the two aforementioned professors are joined in the race by Prof Barnabas Nawangwe, Prof Edward Kirumira. It is understood that current vice-chancellor Ddumba did not apply to keep his post despite earlier giving indications that he would be seeking a second term in office. Sources at the university, however, intimated to this news site that Nzwangwe and Barya are the front runners for the job. Prof Nawangwe is the Deputy Vice Chancellor for Finance and Administration and is responsible for the planning, budgeting and development of the university. He was previously is the former acting principal, College of Engineering, Design, Art and Technology at the university. 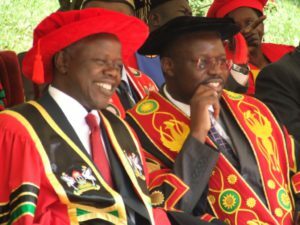 Prof Barya, after leaving Makerere, founded Uganda Technology and Management University (commonly known as UTAMU), that he headed as vice-chancellor from September 2013 until September 2015 when he resigned to try his luck in national politics by contesting for the highest office in the land.